The process of how to make fudge is such a quick and easy one! Basic chocolate fudge only calls for 4 ingredients and can be made in less than 10 minutes and the results are absolutely delicious! Learning how to make fudge is one of those basic baking skills that you can keep in your back pocket to use for endless variations. I love that I can pull out this one simple recipe and make endless variations! And if you’ve never made basic fudge before, would you believe me if I told you it would take you less than 10 minutes to whip up a batch? Honest! Fudge is a candy made of sugar, milk, butter, and a variety of other ingredients, most commonly, chocolate. The very traditional way of making fudge requires making a sugar syrup that is cooked to a very specific temperature and then is cooled and beaten until it thickens. However, there are many fudge recipes that call for the use of marshmallows or sweetened condensed milk in place of the sugar syrup as an easier way of making an equally delicious fudge. Basic chocolate fudge requires so few ingredients it almost feels like cheating when you end up with the final product. One of the ingredients that many fudge recipes don’t include but I highly recommend including is salt. I have always sort of felt that I didn’t actually like fudge. But when I started making my own and included salt in mine, I realized it was just because most fudges aren’t well balanced. The kind of chocolate used in a chocolate fudge recipe is extremely important. I personally like to use a dark or bittersweet chocolate. The amount of sugar in the sweetened condensed milk will make the chocolate plenty sweet and I like all of the complexity of flavors that come with dark chocolate. While a fudge recipe will technically work with a very cheap and low quality chocolate, I wouldn’t recommend it. I have to tell you, I have had a somewhat irrational avoidance of sweetened condensed milk in my baking days. I pretty much avoid most recipes that call for it, thinking that it must be a lame shortcut that a real baker doesn’t need because they can just make things the traditional way. But as I was researching fudge recipes I decided to consider fudge made with sweetened condensed milk because who wants the stress of very precise cooked sugar with everything else going on right now? And I have to say, I was completely mistaken. Here I am inserting my foot in my mouth. Sweetened condensed milk only contains two ingredients: sugar and milk. The mixture is literally a condensed form of milk, meaning most of the water has been evaporated off, mixed with a sugar syrup. The end product is essentially a pre-made version of what you would end up with if you were to make fudge the old fashioned way by making your own cooked sugar and milk syrup. This may seem like a completely obvious realization, but I had just never considered it before. Two ingredients for the price of one and a bonus of not needing a candy thermometer to make your fudge! The process of making a simple chocolate fudge is quite easy. Chocolate is melted with sweetened condensed milk and butter. These are truly the only 3 ingredients needed to make chocolate fudge in its most basic form, however I also always add salt to help balance the sweetness. The chocolate fudge can then be left as is, or any variety of flavorings or add-ins can be added to it to create any flavor you desire. The process of making fudge this way, really couldn’t be simpler. The only thing that really requires some attention to keep your fudge at the right consistency is that you must melt the chocolate slowly and not allow it to get too hot. If it does get too hot it will seize up and the resulting fudge will get grainy. There are 2 methods for making basic chocolate fudge: The Stove Top Method and The Microwave Method. Making fudge on a stove top is my preferred method of making fudge. I believe it is the best way to ensure that the chocolate melts slowly enough and doesn’t seize up. 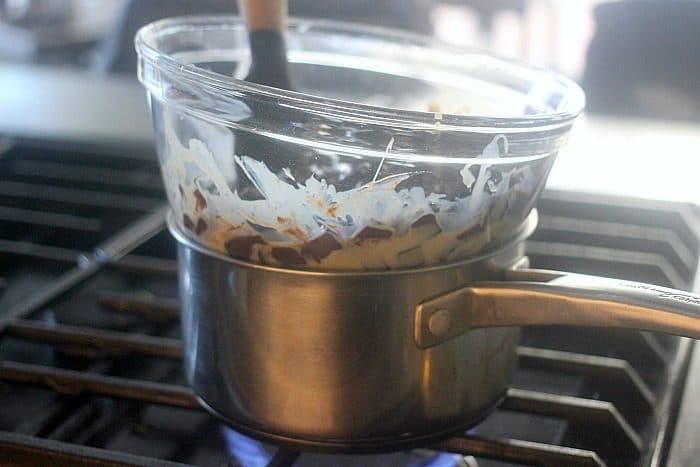 To do this, you need to set up a double boiler. A double boiler is a pot of simmering water that a heat proof bowl sits over. The steam from the simmering water will slowly melt the chocolate. 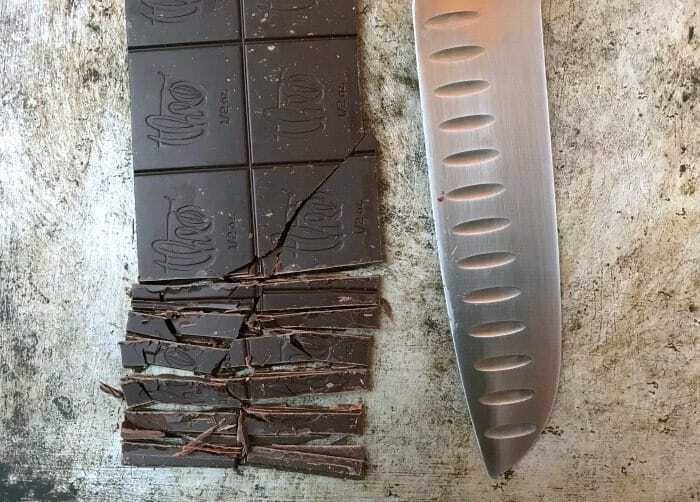 This is much better than putting the chocolate directly in a pot over a low heat, because even the lowest heat can be too much and can burn the chocolate or cause it to seize. All of the basic ingredients for your fudge are put into a bowl and the bowl is set over the pot of simmering water. Stir frequently until you have a smooth consistency. Then carefully remove the bowl from the pot and stir in any flavorings or mix-ins. I will preface by saying that I do not prefer this method because if you aren’t absolutely diligent about standing by and watching it closely, you can very easily ruin your fudge. That said, this does work if you are absolutely adamant about staying right by it. 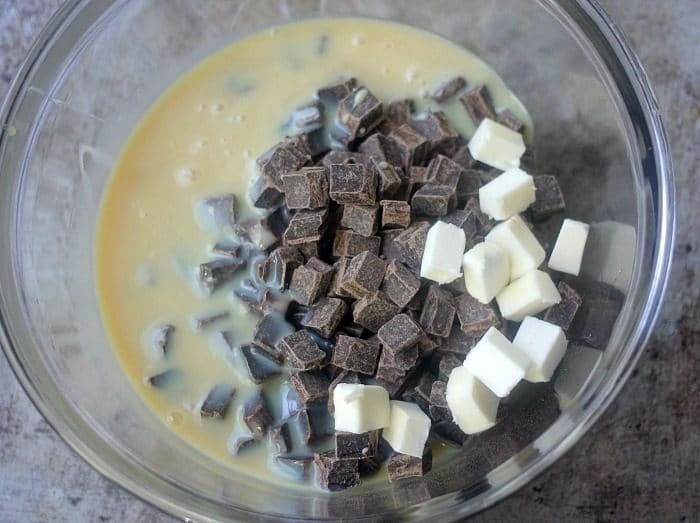 For the microwave fudge method, put all of the basic ingredients for the fudge in a microwave safe bowl and heat in 30 second bursts, stirring in between. Between each 30 second interval, remove the bowl from the microwave and stir thoroughly, making sure to scrape the sides and the bottom of the bowl. This basic recipe can be used as the base for endless variations. Add in spices, extracts, and mix-ins to create all kinds of flavors. I like to split 1 batch into two bowls and make two different kinds at once. Below are some ideas for how to flavor your chocolate fudge. Add coarsely chopped toasted nuts to the fudge mixture before putting it into the pan to set. Add vanilla extract, cinnamon, and cayenne pepper into the fudge mixture before putting it in the pan to set. Add peppermint extract into the fudge before putting it into the pan. 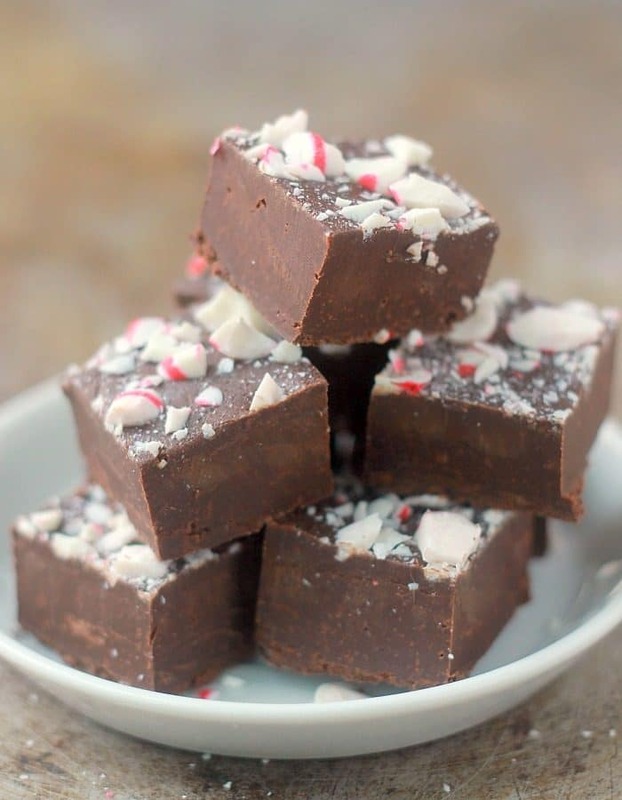 After the fudge is in the pan, press chopped up peppermint candies or candy canes into the top. Pour caramel sauce or dulce de leche over the top of the fudge and swirl it through with a butter knife. Sprinkle the top with flaky salt before it sets. 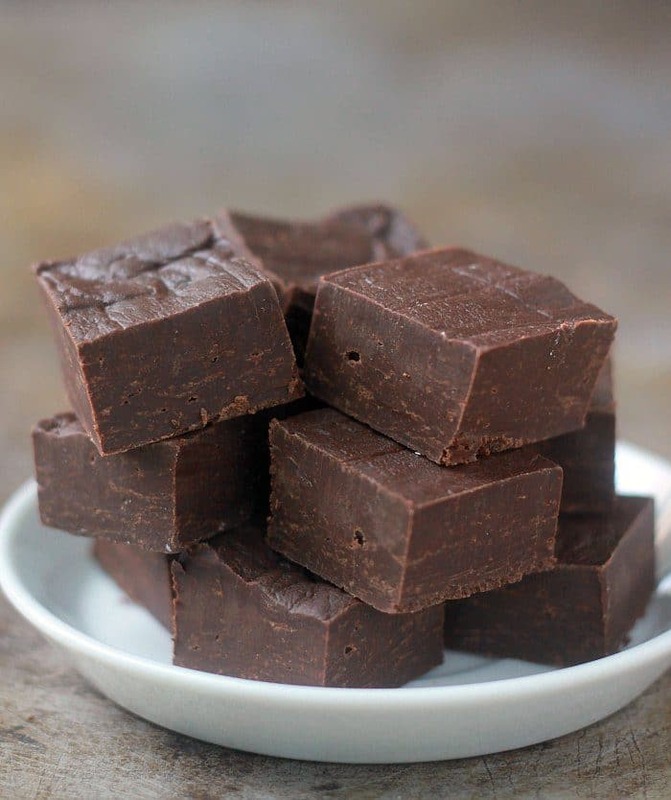 This basic fudge recipe can be made on the stove top or in the microwave and uses sweetened condensed milk to make the process so easy and fast! No candy thermometer required for this recipe and it takes less than 10 minutes to make! If you are not using chocolate chips, roughly chop the chocolate and place it in a medium heatproof bowl. Add the sweetened condensed milk, butter, and salt into the bowl. Stove Top Method (skip this step if you are following the microwave method): Set up a medium saucepan filled without 2 inches (about 5 centimeters) of water on your stove and turn it on medium heat to bring the water to a simmer. This will be the base of the double boiler. Set the bowl over the saucepan of simmering water, making sure that the bowl is not touching the water. If the water is touching the bowl, pour out some of the water. Use a rubber spatula to stir the mixture as the chocolate begins to melt, until you have a smooth texture and all of the chocolate is melted. The mixture will be very thick, almost like a dough. Microwave Method (skip this step if you followed the stove top method): Heat the mixture for 30 seconds on high. Stir the mixture thoroughly, being sure to scrape the bottom and sides of the bowl. Heat for 30 more seconds and stir the mixture again. Heat in 15 second increments, stirring in between, until the mixture is a smooth consistency. This should take about 1 min 45 seconds to 2 minutes total time from start to finish. The mixture will be very thick, almost like a dough. Line a 8x8 or 9x9 pan with foil, parchment, or wax paper. Spread the fudge in the pan using the back of a spoon, a rubber spatula, or an offset spatula, until it is evenly distributed. Smooth out the top. Note: You can also split the batch into smaller tins for gift giving or use a 9x13 pan for a much thinner fudge. Allow to sit at room temperature for about 2 hours or in the refrigerator for 1 hour to set before cutting. The fudge can be stored in an airtight container at room temperature for about 1 week or in the refrigerator for up to 3 weeks. 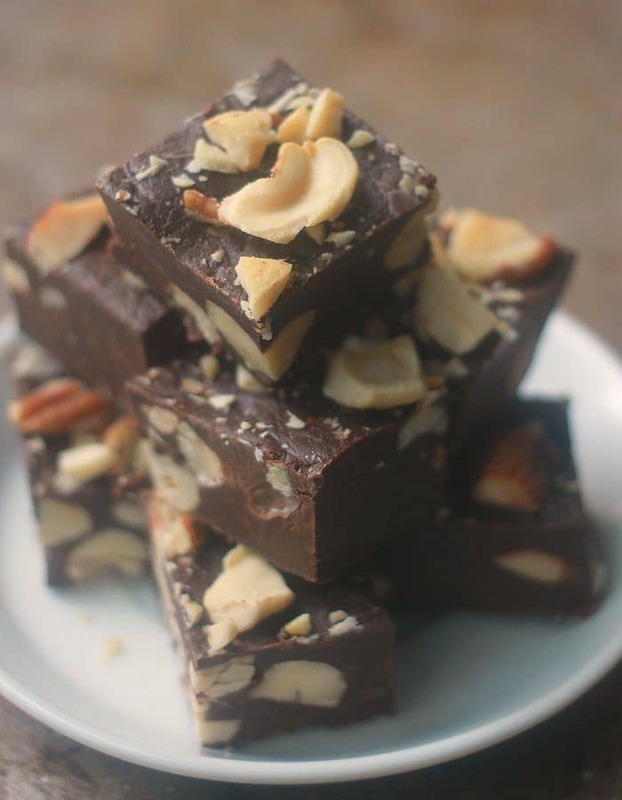 Variation IdeasNut Fudge: Add 1 1/2 cups roughly chopped toasted nuts into the fudge mixture right before putting it in the tin to set. Spicy Mexican Chocolate Fudge: Add 1 tsp vanilla extract, 1/4 tsp of cinnamon, and a 1/4 tsp of cayenne pepper into the bowl with all of your ingredients before melting them all together. Chocolate Peppermint Fudge: Add 3/4 tsp of peppermint extract into the bowl with all of the ingredients before melting them all together. 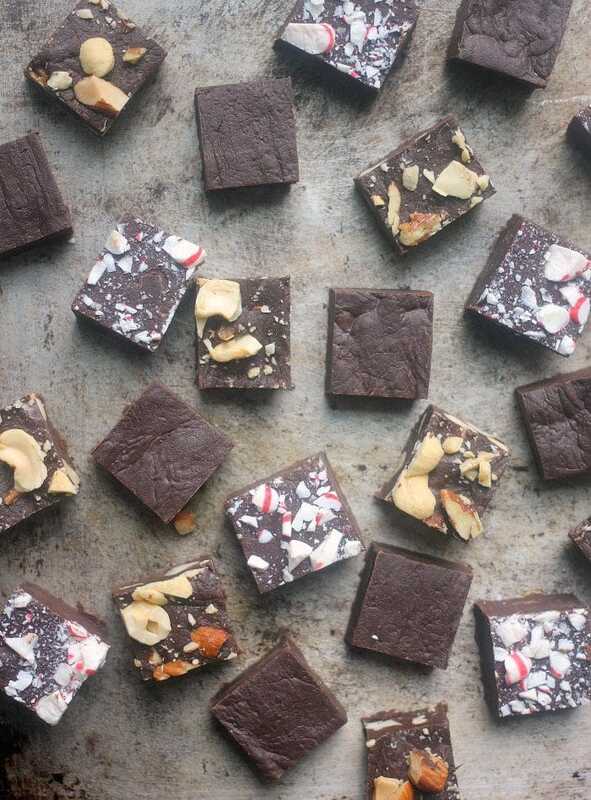 After smoothing the fudge out into the pan, top with chopped up peppermint candies or candy canes. Gently press the candy into the fudge so that they stick. Salted Caramel Swirl Chocolate Fudge: Measure out about 1/2 cup of dulce de leche (you know the kind that comes in a can, like this one?) and heat it in the microwave for about 20 seconds until it is a pourable consistency. Drizzle the dulce de leche over the chocolate fudge once it is already in the pan and use a butter knife to swirl it through. Sprinkle flaky salt over the top of the fudge before it sets. If I want to make a boozy fudge, how much alcohol should I use. ?Also, when should I add it? I like your style Luisa! You can add up to 1/4 cup of “booze” to this! Add it right in the bowl with your other ingredients before you melt! I would do it with the stovetop method! I followed the above recipe EXACTLY using bittersweet Callbault chocolate! It turned out very bitter and not smooth looking like normal fudge at all!!! The condensed milk was not enough to sweeten it. This was a total waste of money and good ingredients!! Hi Mike, I’m so sorry here to hear this didn’t work out for you. I’m a little stumped because I have made this recipe many many times with varying percentages of chocolate (as high as 90%) and it is always plenty sweet. Can I ask if there is any possibility that you used evaporated milk instead of sweetened condensed milk? And if you definitely used sweetened condensed milk, can I ask what brand? I am going to make it again today to see if there is any reason that you would have had this problem. I will also use Eagle Brand to test it. What percentage of chocolate was the bittersweet Callbault chocolate you used? They have varying percentages of their bittersweet. Also, do you like bittersweet chocolate in general? I would suggest using a chocolate that you like to eat as is for this recipe. Because there is so much sugar in the sweetened condensed milk the fudge will definitely taste sweeter than the chocolate does on its own, but if you only like very sweet chocolate then a semi-sweet might be better for you. Also, the mixture will not be liquidy. It will be quite thick. Almost like a dough. You have to use a spatula or back of a spoon to spread it into the pan. Hi. Sorry I couldn’t respond sooner. I typically eat 80% chocolate. I think I thought this fudge would be like other fudge. I also thought the milk would make it sweet given the amount of sugar in it. I gave it to my family and they thought it was very good, not too sweet. I’m glad to hear your family enjoyed it! If I can be of any further help, please don’t hesitate to reach out. Happy New Year! your fudge is gorgeous and perfect! And I love that it’s not overly sweet the way some fudge can be! Amazing Recipe. I’ve tried it at home. Everyone liked it so much. Thank You so much!! So glad you enjoyed it Kunal! I forgot to line my pyrex glass container with parchment paper!! 🙁 Is this a major problem? Will I ever get it out in perfect squares now? Thank you! Recipe worked great and tastes awesome so far! Hi Emily! I think you should be able to loosen it by running a butter knife around the edges after it is completely firm! Glad you enjoyed the recipe! I added sweetened condensed milk two table spoons of butter due to the butter being salted i did not add salt. I boiled water placed bowl over pot of boiling water, mixed in 1 pound of cake icing. It all melted into a liquid and remains a liquid after refrigerator fo 4 hours and setting out for 4 hours. Hi Kenneth, were you making a different fudge recipe? Or were you trying to substitute cake icing for the solid chocolate? I’m afraid if you do not melt down solid chocolate in this recipe it will not solidify. That is really a key ingredient. You can likely use what you made as a frosting, but I don’t think it will ever solidify as a fudge. Hi Bettie, wouldn it be possible to mix in mini marshmallows into this recipe? Can you think of any pitfalls I may encounter and possible solutions to using such a soft mix-in to this fudge recipe? Thanks! Hi Meg! You can definitely mix in mini marshmallows! That should work well and will be delicious! First time to ever make fudge! Was surprised how simple it is to make following your recipe! Love it! I’m so glad to hear that Randall! That is awesome! My water started out at simmering and eventually got to a boil. My fudge not got super dough like. Thought is was ok and I had it set in the fridge for an hour. Then room temp for 45 min. It never thickened to fudge consistency. It taste great but it’s not really a fudge. Where could I have gone wrong? The only change I made was I used half the salt to test the first batch’s flavor. I’m going to update the recipe to specify to make sure you are using sweetened condensed milk instead of evaporated milk. The cans look so similar. I’m fairly certain that is what happened. That is what this sounds like. If not, I’m really not sure what could have caused this. That is very strane. The “fudge” also has a big shine to it which I normally do not see in fudge. I also used semi sweet cause I prefer that to bitter sweet. I also used a baking chocolate aposed to chocolate chips. I’m pretty bummed round 1 failed trying to make this for Christmas. Any help is very appreciated. Hi Rich, it really sounds like what happens if you accidentally use evaporated milk instead of sweetened condensed milk. Do you think it’s possible this is what happened? I just made this. Followed all the ingredients and directions. It is DELICIOUS. The fudge I was hoping for. So easy as well. Thank you so much! That is so great to hear Mia! I’m so glad you enjoyed it!